It's arrived. Finally. Was it worth the wait? 2007's Top Products No one could have missed the recent mass of media attention surrounding the impending UK, European and Australian launch of Sony's PlayStation 3. And after months of prolonged waiting, it has arrived. We conduct an in-depth review of this eagerly-awaited games console and discover what all the fuss was about. The newest addition to the games console arena is a no-nonsense piece of hardware: big, black and looking like it means business. 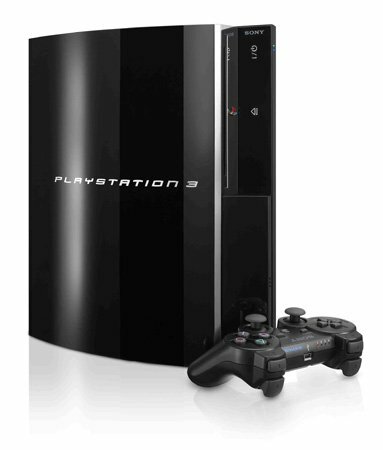 The PS3 weighs in at a whopping 5kg - substantially heavier than either the Xbox 360 or the Wii, which respectively register 3.5kg and 3.1kg on the scales. The rounded edges and polished surfaces give it a sleek and stylish appearance - a world away from the look of the ageing, angular PS2. The new machine feels sturdy and well-built, yet at the same time like it deserves to be treated with the upmost care. Maybe it's the luxurious-looking shiny black casing with the silver highlights. Or maybe it's the thought of having just spent £425 on the thing. Either way, the PS3 is a product you immediately want to treasure. Like its predecessor, the PS3 can placed horizontally or on its side, its slot-loading optical drive easily accessible in both orientations. A lift-up cover discreetly hides the memory-card slots, which include Compact Flash, SD and Memory Stick Duo. Four easily accessible USB ports sit under the main body of the console to connect controllers for charging. The primary power switch, slots for the AC cord, and the AV and HDMI ports used to connect the PS3 to a TV, are situated at the back of the unit.